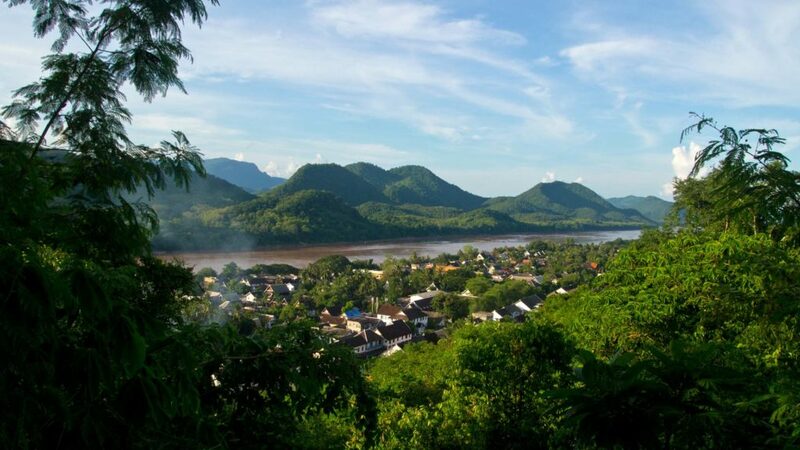 The Mount Phou Si, which means something like sacred mountain, is located in the heart of Luang Prabang on a peninsula surrounded by the rivers of Mekong and Nam Khan. 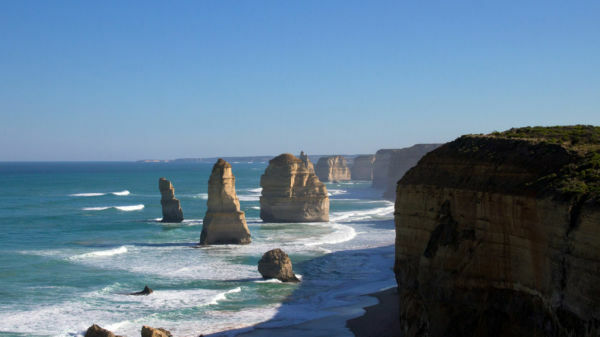 The mountain is about 100 meters high and a popular sight with visitors of the city. 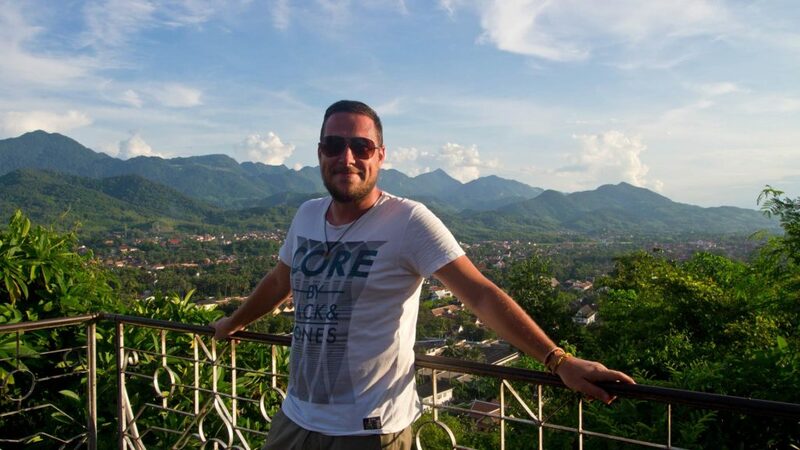 Most of them are visiting the mountain for sunset to enjoy the terrific 360° panorama of Luang Prabang. 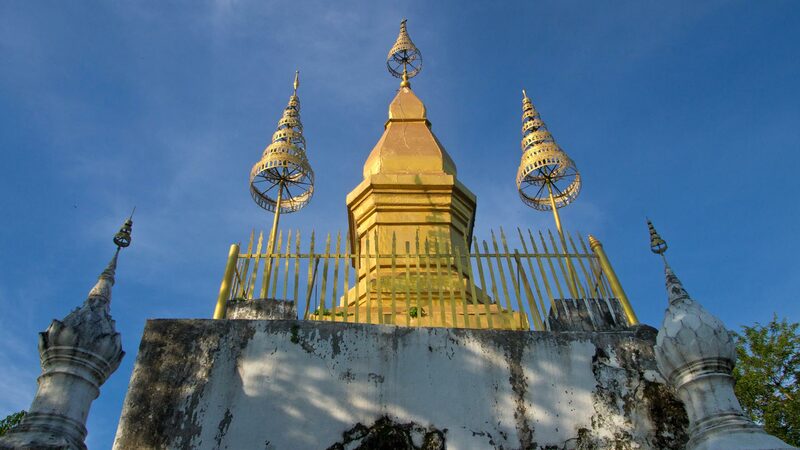 On the top of Mount Phou Si you will find the Wat Chom Si with its golden 20 meters high Stupa. But until then you will have to take a few steps up. The number of steps depends on which path you choose to climb up. 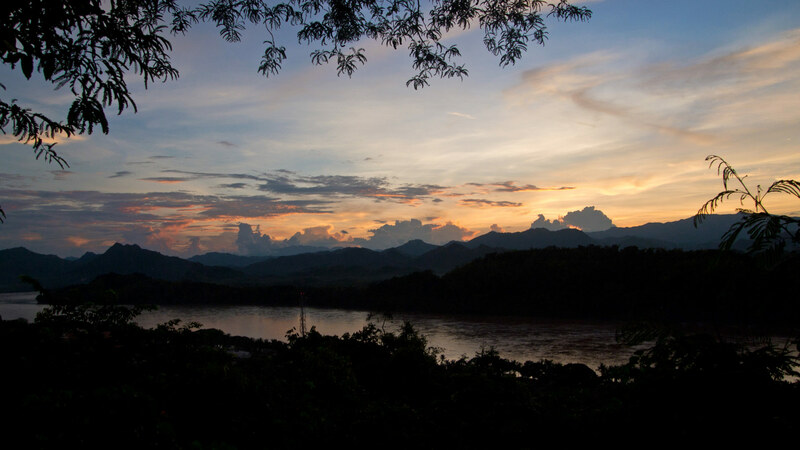 There is a rise from the Sisavongvang Road, where the night market of Luang Prabang takes place, with 328 steps. There isn’t much to see on this path, which is why I prefer the second one. 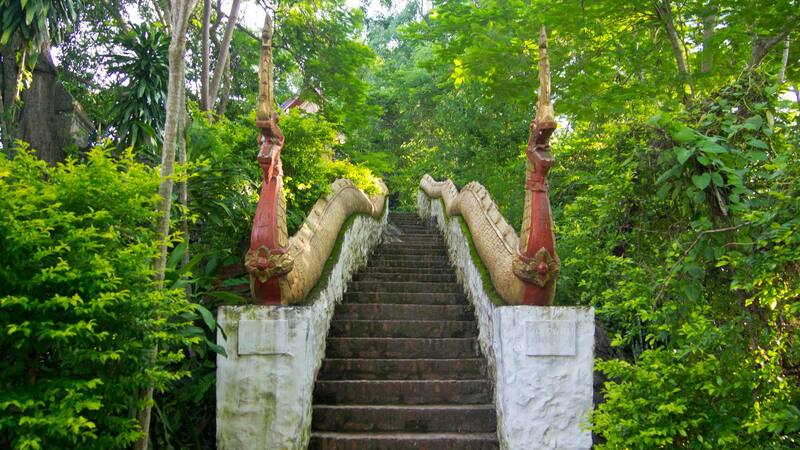 The second way up with 355 steps is located at the Thanon Phousi, next to the Nam Khan River. 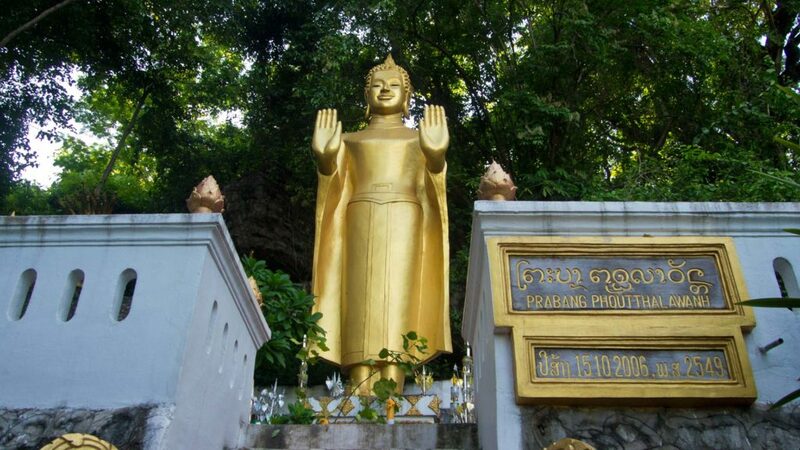 Here you can find lots of viewpoints while walking up, as well as the Wat Tham Phou Si with many statues of Buddha. You can even see a footprint of Buddha over there. Half way up you will have to pay an entrance fee of 20,000 kip (about 2 euros) per person. 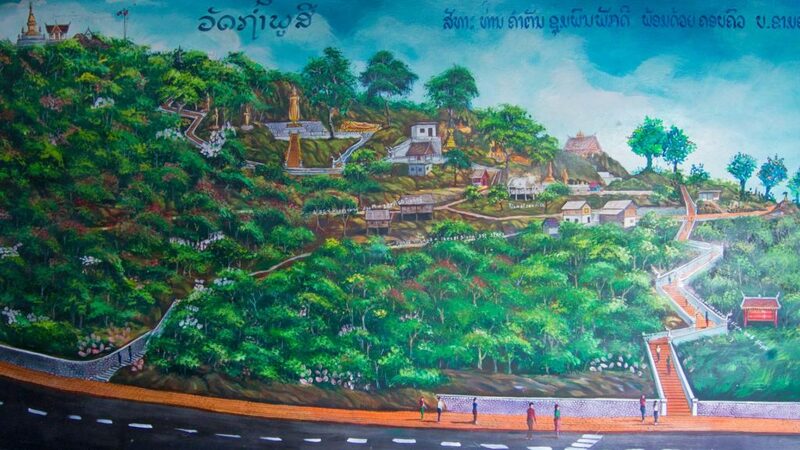 There is also a nicely drawn map of all the sights along the way to the top of the Mount Phou Si. After a few more steps, some large statues of Buddha and even more viewpoints, you will eventually arrive after approximately 30 more minutes at the Wat Chom Si with its golden Stupa. 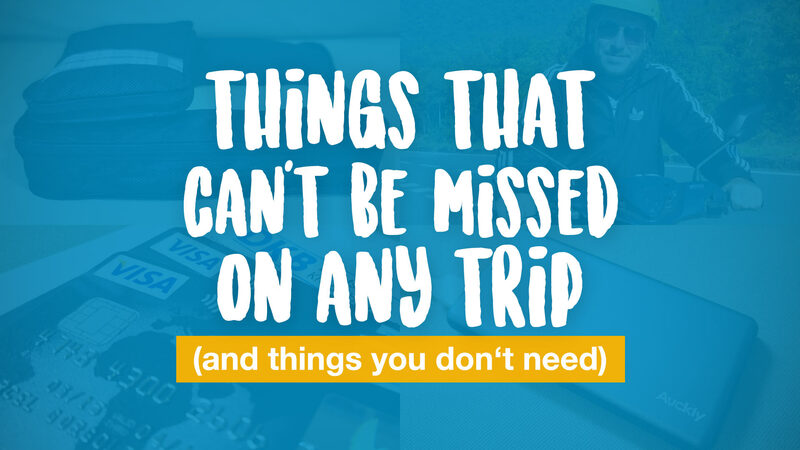 Depending on how much time you spend with the sights along the way. 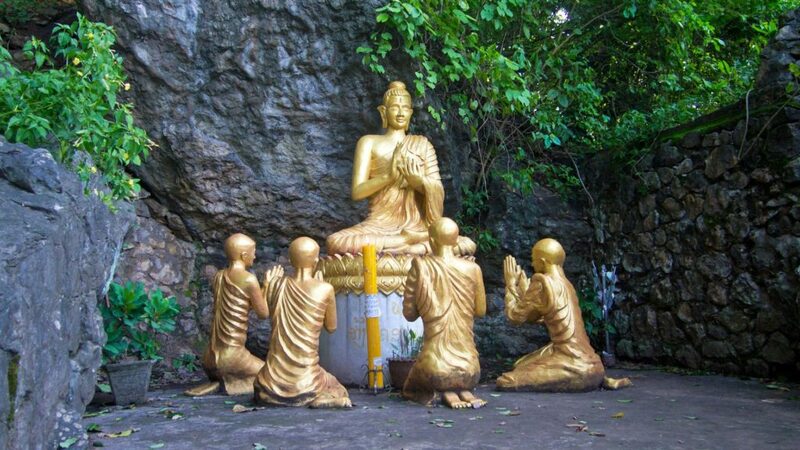 The local visitors usually make a lot of stops on the way up to pay their respects to Buddha or to pray. 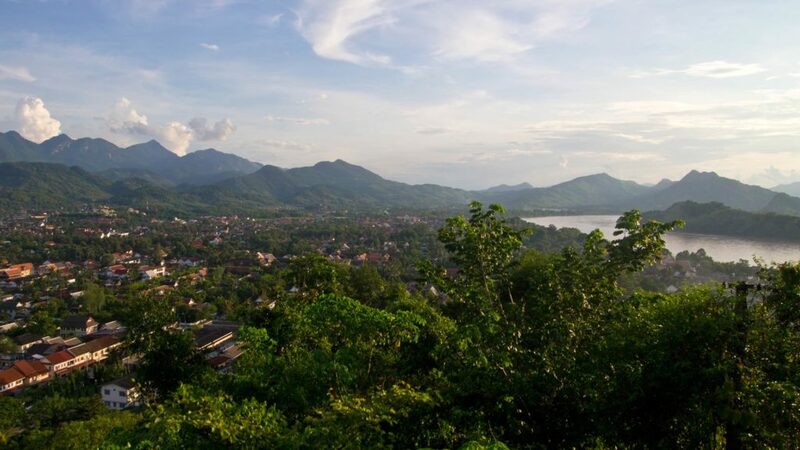 After the 328 or alternatively 355 steps, you will arrive at the top of Mount Phou Si. Now you can finally visit the Wat Chom Si and its 20 meters high golden Stupa, which you can see already from far away. 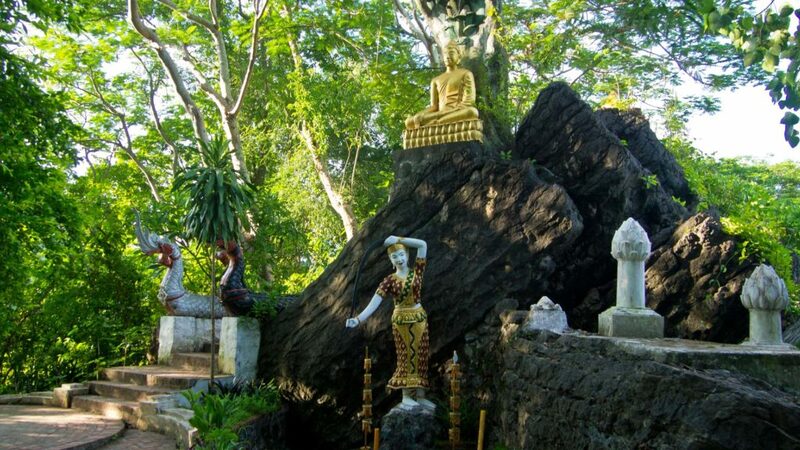 Next to the 1804 built Stupa, there is a small Viharn with a large seated statue of Buddha. In addition, there is a small stall where you can buy drinks, snacks or even some flowers. Those flowers are bought to pay homage to the Buddha. 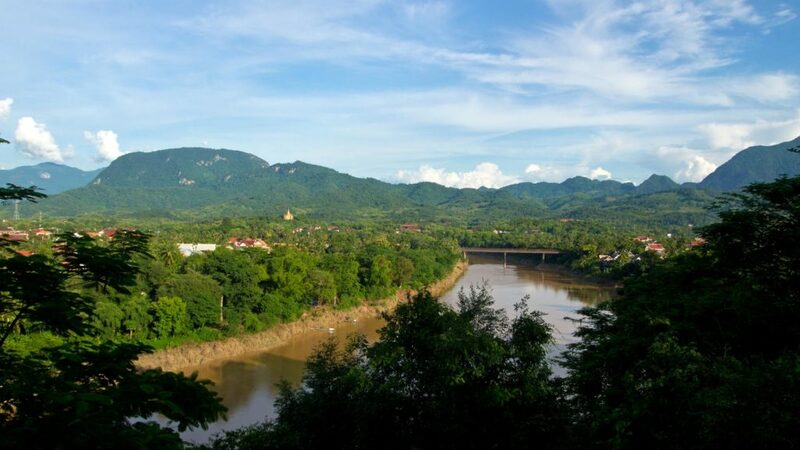 However, most of the tourists don’t come to visit the temple, but rather to enjoy the fabulous view over Luang Prabang and the surrounding mountains and rivers. 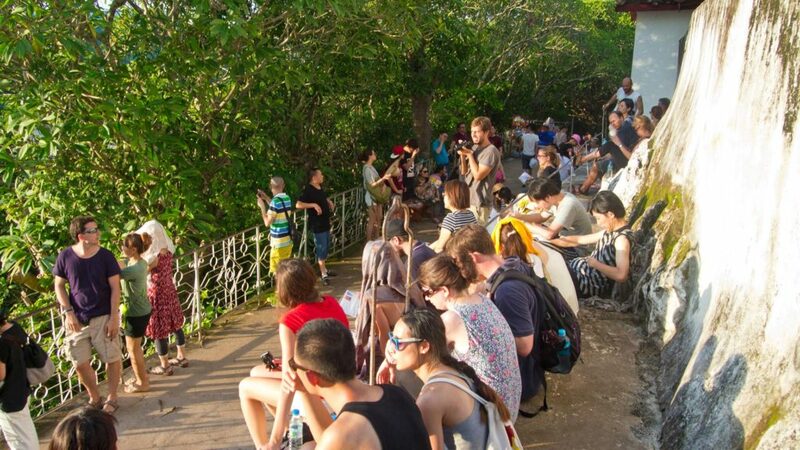 It’s particularly busy over here at sunset, because there are hundreds of people looking for the best spot. 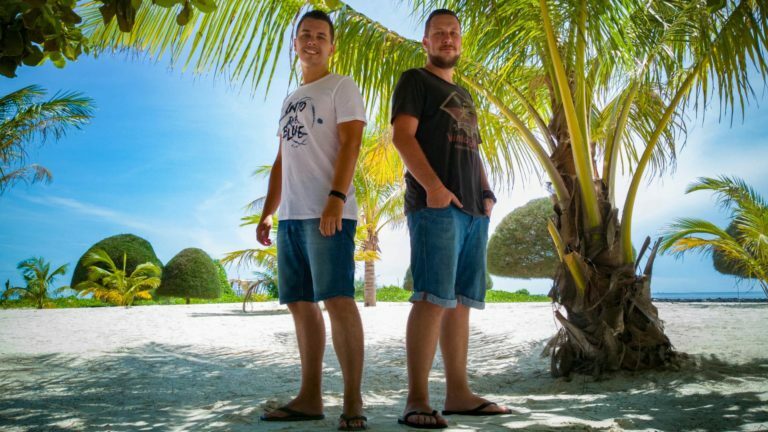 If you like to have a good spot to take a picture, you should get there early around 4.00 – 4.30 P.M. Otherwise it will be most probably too crowded. But even if you arrive relatively late, you can still take some great pictures. As soon as it gets a little bit dark, most of the people are starting to make their way down and you will have a lot of space to take some nice pictures. I can recommend a visit to everybody who is staying in Luang Prabang. The way up and the view at the city are really impressive. In my opinion it’s one of the must-sees of Luang Prabang! 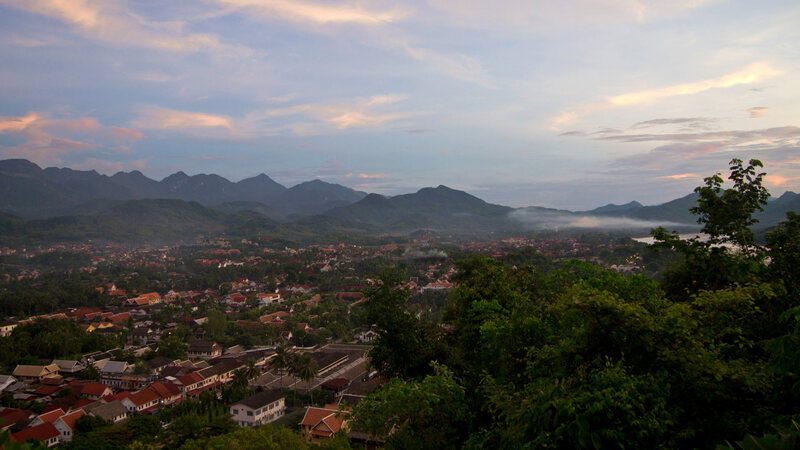 Have you ever been to the Mount Phou Si in Luang Prabang? Have you been there for the sunset? Did you like it? Leave us a comment below! We were in LP three years ago, and there was no fee anywhere on Mount Phousi. Is this a new thing? I was there in August 2015, so 2 years ago now, but there was a small pay booth. Maybe that was a new thing. Great breakdown of Mount Phou Si! I love how everything looks untouched, hope this picturesque view stays on forever.